Seniors who recognize the early warning signs of diabetes are often able to reverse the condition with certain lifestyle changes. However, many seniors fail to treat their diabetes because they attribute the symptoms to other age-related medical conditions. If your loved one has been diagnosed with diabetes, consider hiring a professional caregiver to help him or her manage the condition. When considering in-home senior care, Oshkosh, WI, families should make sure their senior loved ones have the resources they need to maintain their independence and remain healthy. Trusted in-home care professionals can assist seniors with daily tasks like cooking, bathing, and exercise, and they can also encourage them to focus on healthier lifestyle habits. Here are 7 early warning signs of diabetes that should not be ignored as well as tips on preventing this pervasive disease. When a senior’s blood sugar level rises, he or she begins to pass sugar through the kidneys and into the urine. Over time, this dehydrates the senior and makes him or her feel constantly thirsty. Seniors who experience dry mouth or constant thirst should drink a few extra cups of water a day to keep their kidneys healthy. Seniors with prediabetes may notice changes in their metabolism. However, eating sugar-laden foods to stabilize their blood sugar can worsen the condition. Alternatively, they should eat healthy snacks that give them long-term energy such as unsalted trail mix, oatmeal, and hard boiled eggs. 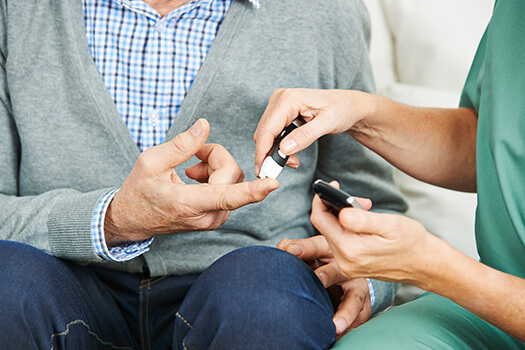 The glucose levels of a diabetic senior can fluctuate quite a bit throughout the day, and the body may respond by making him or her feel tired. While chronic fatigue can be caused by many different things, seniors who experience it should have their blood sugar tested. They must also seek medical assistance if the chronic fatigue is accompanied by unusual personality changes such as irritability and mood swings. Diabetes is often diagnosed during eye doctor visits. Ongoing glucose fluctuations can result in a variety of eyesight problems, including blurry vision and difficulty seeing at night. Seniors should schedule eye doctor appointments at least once a year to be tested for vision changes. In a healthy body, the arteries immediately send blood cells to a wound to begin the healing process. In diabetics, the arteries become damaged and lose their ability to effectively transport blood cells. A wound that won’t heal is one of the most common signs of diabetes, and it often results in secondary complications such as infections. The vast majority of diabetic seniors will experience neuropathy at some point. Much like wounds that heal slowly, seniors experience a tingling sensation because the arteries can no longer send an adequate supply of blood to the extremities. Some seniors are able to reduce their neuropathy by wearing compression garments on their arms and legs. Skin that is dry or itchy is common among seniors who have problems regulating their blood sugar levels. Excessive scratching can lead to lacerations and rashes that can take weeks to heal. Seniors with dry or velvety skin should use very mild soap when showering or washing their hands. They can also apply unscented lotion to their skin throughout the day to help relieve the itching and prevent further damage. A professional caregiver can help a senior adopt a healthy lifestyle and manage diabetes. Some seniors need occasional assistance at home, and oftentimes the family members who take care of them need time away to run errands, take a nap, go to work, or take a vacation. Oshkosh, WI, respite care experts from Home Care Assistance are available on an as-needed basis, giving your family peace of mind that your loved one will remain safe and comfortable while you relax or focus on other important responsibilities. The symptoms of diabetes can be exacerbated if a senior also has an age-related cognitive disorder such as dementia. Many families have no experience in specialized home care for seniors, which can make life a bit more challenging when an elderly loved one is diagnosed with dementia. The Oshkosh, WI, dementia home care experts at Home Care Assistance are here to help. We designed a program called the Cognitive Therapeutics Method, which uses mentally engaging activities to slow the progression of dementia, and all of our live-in and respite caregivers are expertly trained in dementia care. For more information on our senior care services, call one of our experienced Care Managers today at (920) 710-2273.